"Whoever stops his ears at the cry of the poor, He will also cry out, but shall not be heard. 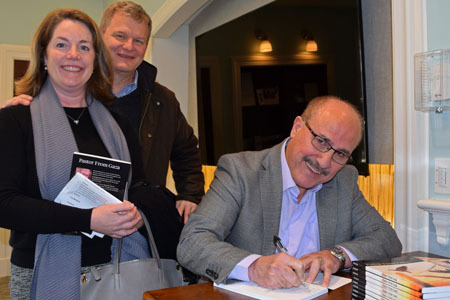 Proverbs 21:13 "
“Pastor from Gaza” is Hanna Massad’s book about his life in Gaza, and then in Jordan. He and his wife Suhad and their two teenage daughters now live in Connecticut. They are bright shining lights to many Christians who live in dangerous Middle Eastern places. 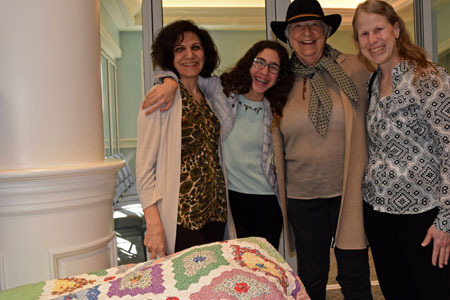 Friends of Suhad admire the handiwork of Iraqi women in Jordan, who worked together to create a beautiful hexagon quilt. It is a masterpiece of thousands of two inch squares of fabrics that are reproductions of 1930’s cotton prints. 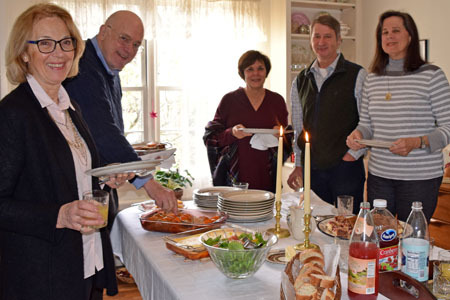 Rowayton friends and neighbors gathered in our home one Sunday for our annual brunch. It was a fun time, and it helped everyone to chase away the winter blahs - for one afternoon, at least. 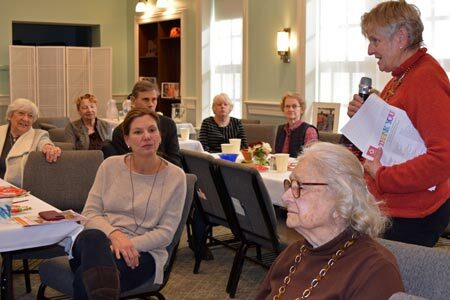 The PEP (People Encouraging People) group at Noroton Presbyterian Church in Darien, CT learned all about the opioid crisis, which is happening among seniors as well as young people. 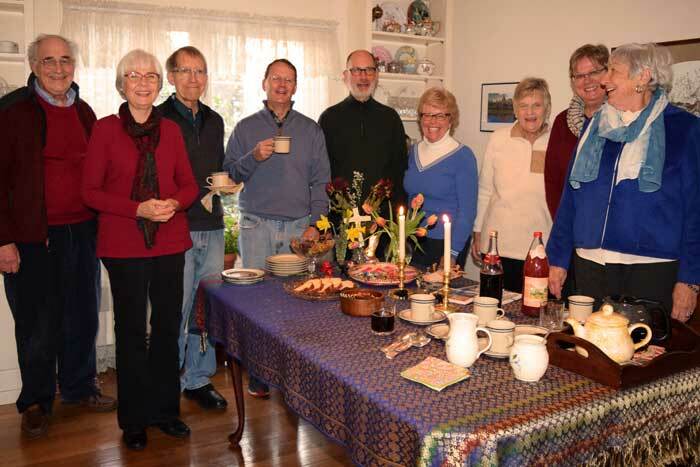 We did our retirement in Kenya slide presentation at the PEP (People Encouragring People) gathering at Noroton Presbyterian Church. 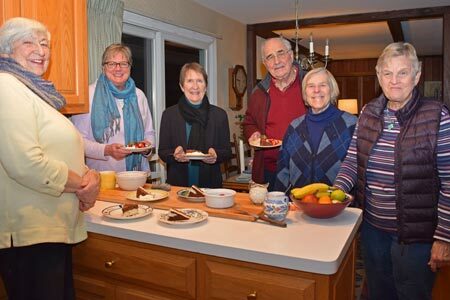 This group meets every third Thursday. There is always a speaker, and there are always lots of good snacks. Our small group of 12 people met on a Sunday evening to finish our discussion of the “Chase the Lion” book by Mark Batterson. We are now ready to start “What’s so Amazing About Grace?” by Philip Yancy. We always have great desserts before we begin our discussions. 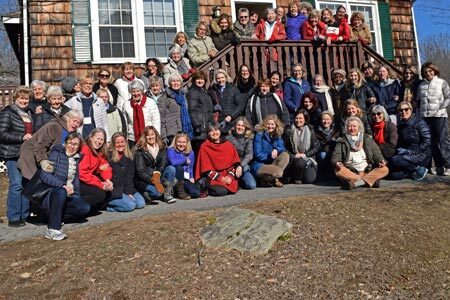 Marilyn, and around 90 other women, spent a weekend at the NPC Women’s Annual Retreat at the Incarnation Conference Center in Ivoryton, CT. 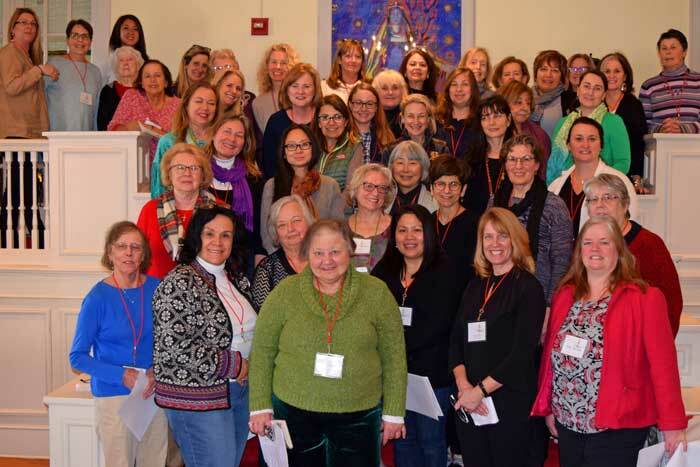 The theme was “Considering Joy” and the guest speaker, Rev. 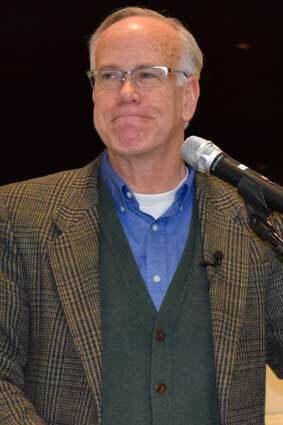 Pat Battern, encouraged everyone to “Rejoice in The Lord always” - Philippians 4:4. Her book on parenting will be published in April. Our Kenyan friend, Rev. 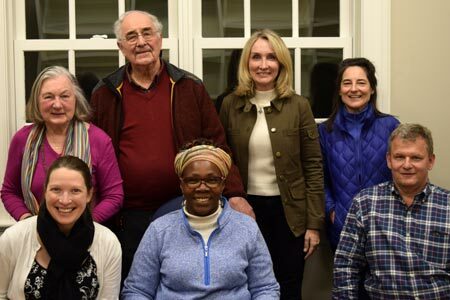 Evalyn Wakhusama, who is the founder and director of Nambale Magnet School, spoke to the NPC Mission Team about the joys and needs of the school. NMS opened its doors in 2009 with just 35 students, and now ten years later, there are 425 nursery and primary students in twelve classes. 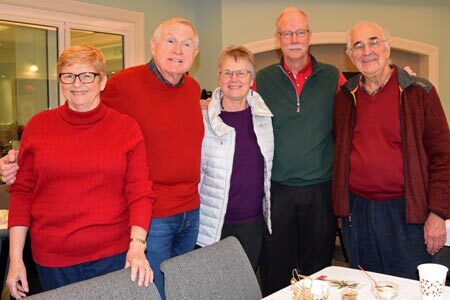 Around 30 PEP (People Encouraging People) friends gathered at Noroton Presbyterian Church in Darien, CT for a wonderful Christmas lunch. And then three members of the choir lead them in a carol sing to celebrate the birth of Christ. 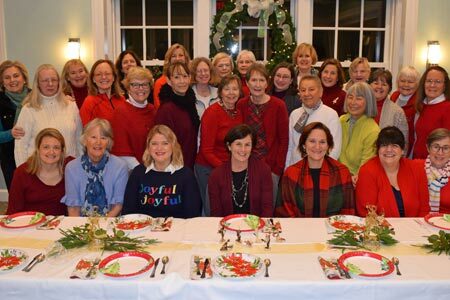 The women in the early morning (6:15 am) bible study at NPC feasted with a buffet breakfast after having finished reading and discussing the complex life of David, “a man after God’s own heart”, in Samuel 1 and 2. 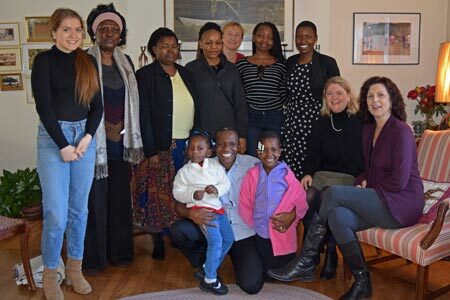 We had an International Thanksgiving Day with eight friends from Kenya and two from Australia. 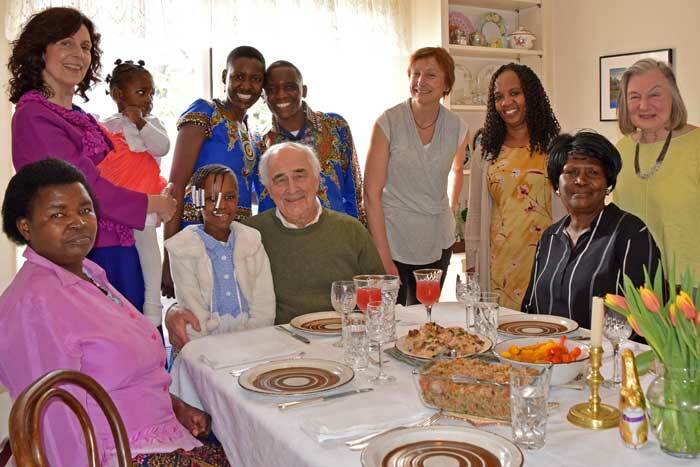 We cooked the turkey and the traditional foods that go with it, and our friends brought their favorite festive Kenyan foods, including samosas, pilau, fried plantains and mukimo. 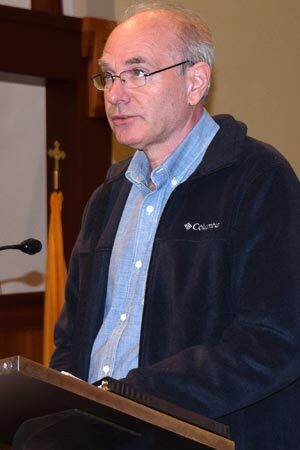 Russ Brine, who is the Chairperson Trustee of St. John Bosco Education Trust, spoke one weekend at all six masses at St. John Church. He thanked the people of St. John Church for their generous support of 45 students at the St. John Bosco Centre in Kitali, Kenya. All of them will be attending good quality Catholic boarding schools when the new school year begins in January. Our small group of twelve people is gathering every other Sunday evening. We are reading and discussing “Chasing the Lion - if your dream doesn’t scare you, it’s not big enough”. It’s by Mark Patterson, who is with a church in Washington, DC, that started there in Union Station. It was wonderful to see so many kids in Darien helping to feed God’s hungry children in other parts of His world. 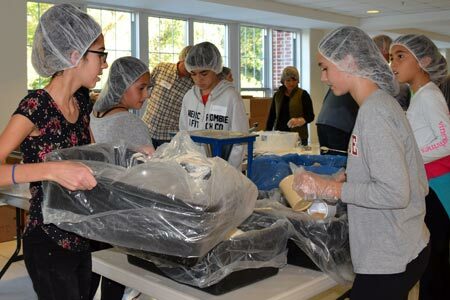 Around 200,000 meals consisting of rice, soy, veggies and vitamins were packed over a weekend. Over 300 hundred friends and family celebrated Pete’s life at a wonderful Eucharistic Celebration of Resurrection at St. John Church in Darien. And afterwards everyone gathered at Woodway Country Club for a luncheon reception, and we heard stories about fun times with Pete from some of his close friends. Our friend Russ, who had lived in Kenya for 15 years and has been in Cambodia these past two years, spent a week with us. 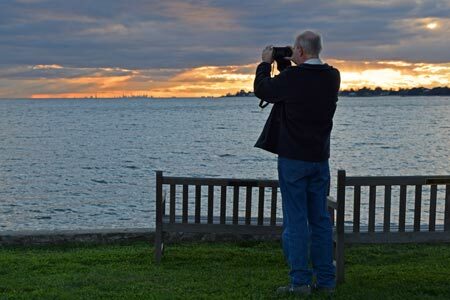 He grew up in Seattle, and so he enjoyed being close to the water, and walking to the beaches and seeing the beautiful sunsets here in Rowayton. 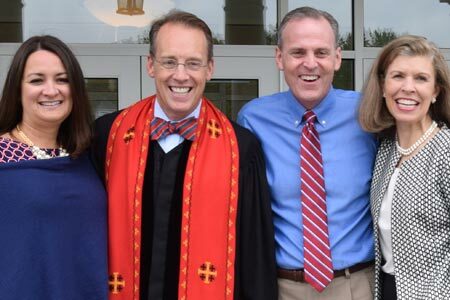 Noroton Presbyterian Church installed Greg Doll as its new Senior Pastor - and his new friends at NPC, as well as many friends from his previous time at NPC, were there to support him in this new role. We attended the wedding of the daughter of one of Marilyn’s friends for the past forty years. 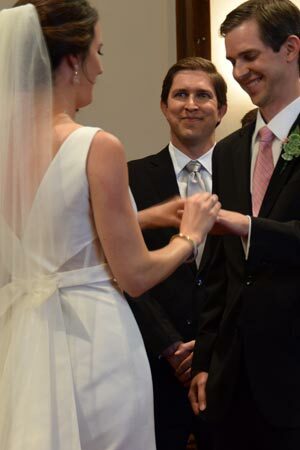 The bride looked just like her mother looked when Marilyn met her at work in New York City. And the line, “I don’t remember growing older, when did they?” from Fiddler on the Roof, kept running through Marilyn’s mind. 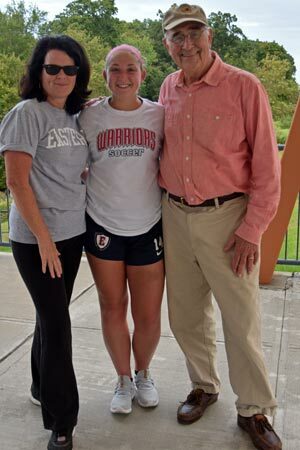 John’s granddaughter is a second year student at Eastern Connecticut State University - and she’s a starting defense player on the women’s soccer team. 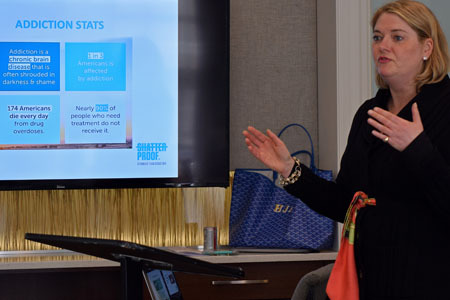 We remember seeing her play when she was in kindergarten and just five years old - and, again, we think "I don't remember getting older......."
PEP (People Encouraging People), which meets every third Thursday, is the new name for Prime Timers at NPC. 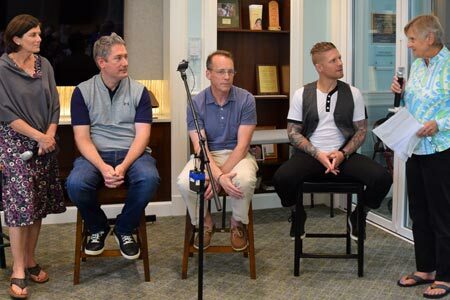 At this month’s gathering all four pastors spoke of how they got into ministry and how they came to serve at NPC. Our small group met in our home, and we started reading and discussing a new book. It’s the one John gave me for my birthday. In “What did Jesus ask?”, 70 spiritual leaders offer thoughts on some of the questions that Jesus asks in the bible. 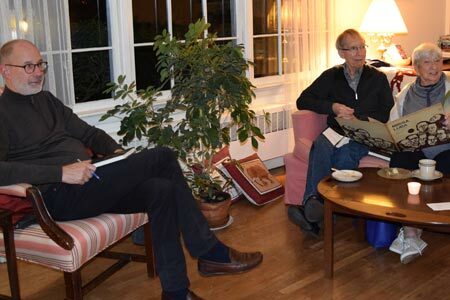 Tom Becker, one of the missionaries supported by Norton Presbyterian Church in Darien, CT, discussed his work with the Roma people in Eastern Europe. He recently helped with the making of a documentary film, "We Are Here - A Story of Jesus and The Unseen Roma." 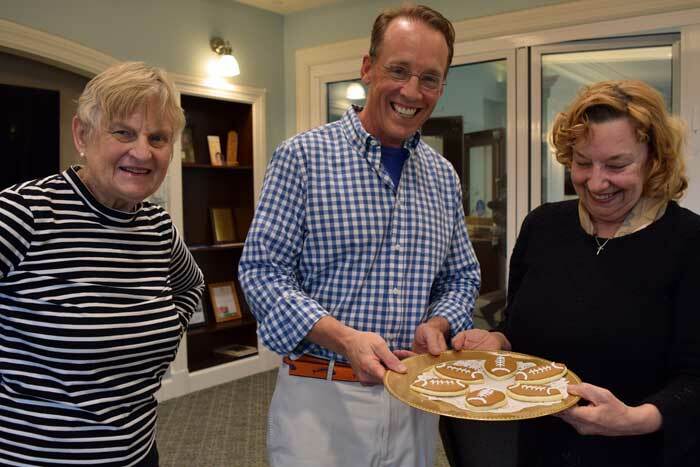 Greg Doll met with the Prime Timers at NPC, and talked about his work as Chaplain of the New York Professional Soccer Team and his involvement with Fellowship of Christian Athletes. He has inspired many high school athletes from several churches in Darien, CT to meet and pray early every Monday morning. 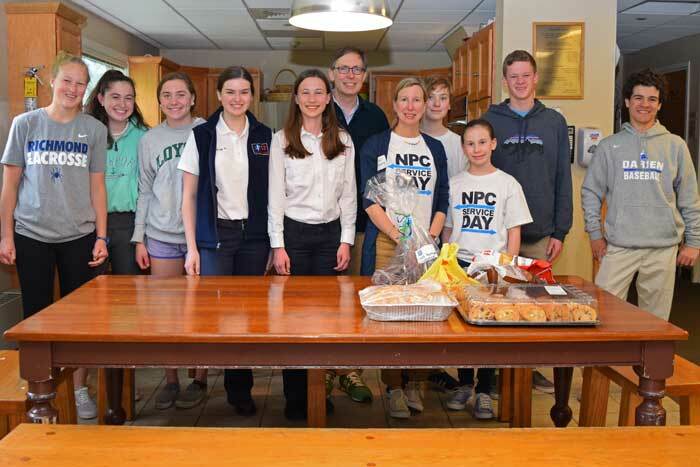 Service Day at NPC was a new way of worshipping and giving glory to God on the Sabbath. 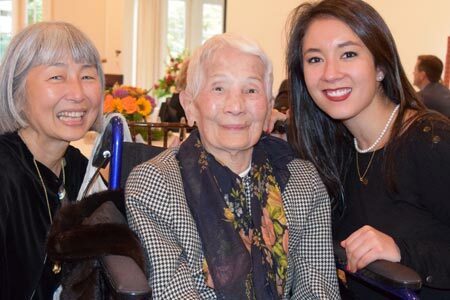 Around 200 people, including many families with young children, enjoyed being together and doing projects to show their appreciation for others in the community. You can see them live, at work, on Service Day 4-29-18. 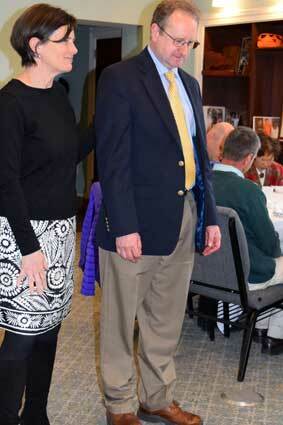 We attended the lectures of Mark Roberts at Noroton Presbyterian Church in Darien, CT one weekend. He and two editors at Zonderman compiled “The Story of God Bible Commentary on Ephesians”. His talks were on Ephesians 4:1- 6 - how we are all called to “walk in the good works that God has prepared for us”. And how we are to humbly, gently and patiently bear with each other in love. 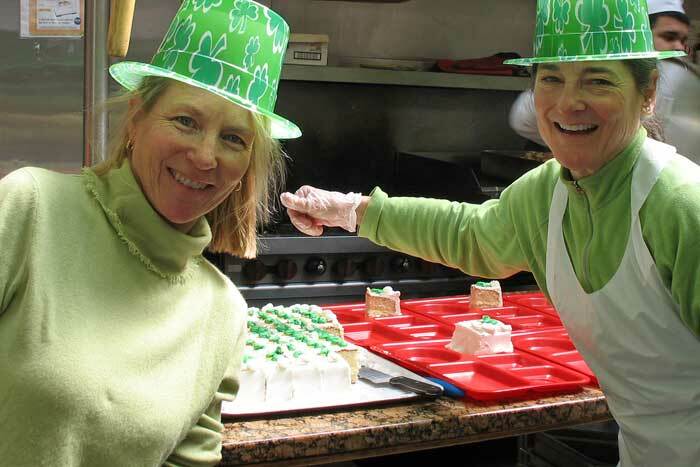 On St. Patrick’s Day, we served lunch at the Open Door Shelter in Norwalk, CT. Around fifty men and women enjoyed corned beef and boiled potatoes, cabbage and carrots. We all wore something green, and were Irish for this special day. We celebrated The Risen Christ with Easter dinner in our home. Our Kenyan friends bought pilau and mukimo, two favorite national dishes, and our Australian friend came with Pavlova, a delicious dessert. And John baked lemon pies! men and women enjoyed corned beef and boiled potatoes, cabbage and carrots. We all wore something green, and were Irish for this special day.